Researchers have used 3D live imaging to observe the formation process of lateral roots in plants, and clarified part of the mechanism that creates new meristematic tissue. If the root formation mechanism in plants is revealed further, this could potentially be used to control plant growth by artificially altering root system architecture. These findings were published on August 10 in the online version of Development, and clips of the live imaging were selected as the Featured Movie of the current issue (Vol. 143/Issue 18). The research group included Professor FUKAKI Hidehiro (Kobe University, Graduate School of Science), Project Assistant Professor GOH Tatsuaki (Kobe University, currently Assistant Professor at Nara Institute of Science and Technology), the University of Nottingham and the University of Montpellier. Plants develop a root system adapted to their environment by growing new branched roots from existing roots. Root systems consist of the primary root, which is the first to grow after germination; lateral roots, created from internal tissue in existing roots such as the primary root; and adventitious roots, which sprout from above ground tissues. There is only one primary root, but after plant germination many lateral roots and adventitious roots are created. Since these latter types make up the majority of the root system, they have a large influence on its structure. For a root to grow, new cells must be created in the root's meristematic tissue, located at the tip. In contrast to the primary root's origins as a radicle created in embryo, lateral roots are made from a subset of inner layer cells after germination. Thanks to research in genetics and plant tissue our understanding of the mechanism that creates the primary root has advanced, but there are still many unknown factors in the mechanism that creates lateral roots from a small number of cells. The research group established a method enabling long-term observation of the developmental process of new roots (lateral roots) formed after germination of the model plant Arabidopsis thaliana. Their method is based on 3D live imaging technology using confocal laser microscopy. By comparing plant variants that showed abnormalities in the morphogenesis of lateral roots to plants with a natural development process, they elucidated part of the mechanism that develops lateral roots and the root meristem. Notably, they clarified the mechanism that establishes the "quiescent center cells" – important cells for the functioning of the meristem. 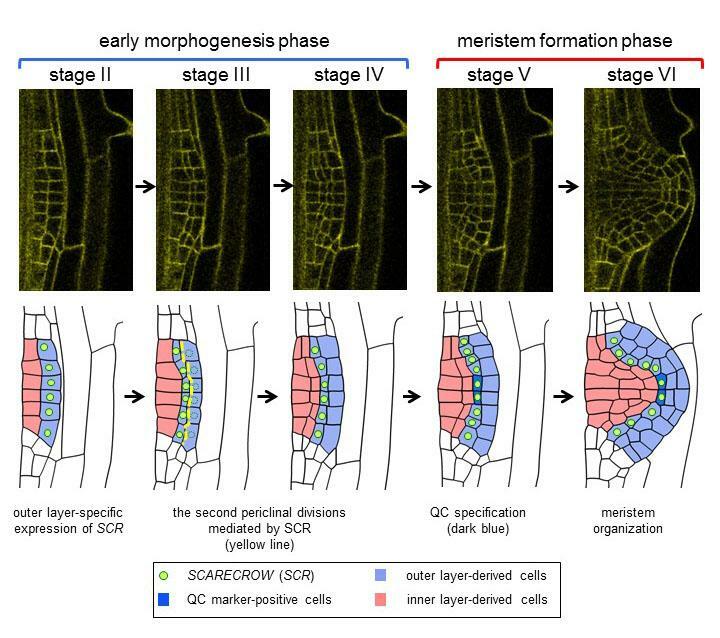 Now we can observe the development process of lateral roots over time on a cellular level, our understanding should deepen regarding various processes: how individual cells divide, how they mutate, and how the cells coordinate to create new roots. In the future, if we can fully decode the mechanism for increasing roots, we could potentially regulate the growth of various crops and garden plants by artificially altering root development.